All invoicing must go through Business Services. An approved agreement/contract is required for each individual customer before an invoice can be created. Agreement/contracts must be reviewed and approved by the ACC contracts department. Note: There are some departments that bill for services that do not require a contract (i.e. library fines). 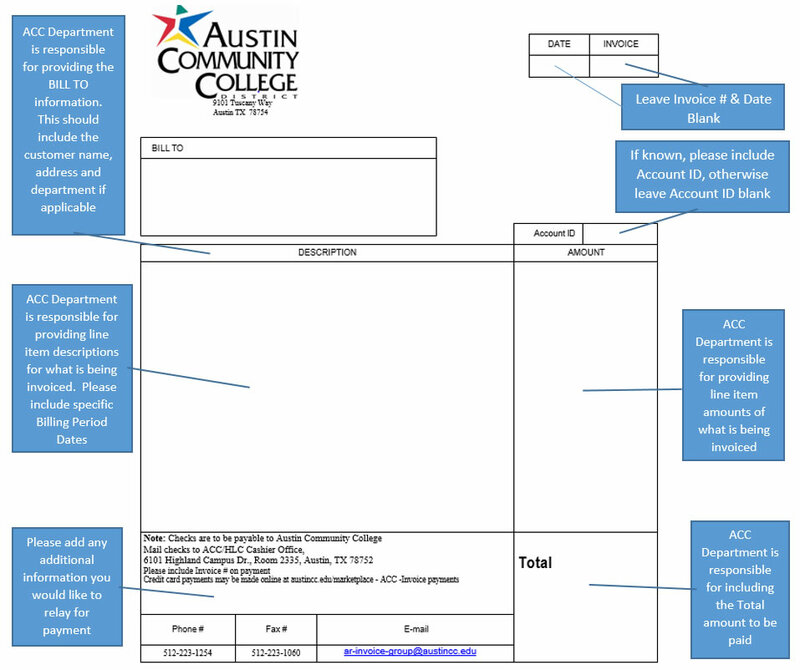 When emailing the invoice to ar-invoice-group@austincc.edu, please specify in your email which GL number and/or AR Code you would like the invoice coded to. Also, include in the email, the customer’s email address(s) so that Accounts Receivable can email the customer the invoice once it has been finalized. For expense reimbursement requests, please include in your email all GL numbers associated with each expense to be reimbursed. 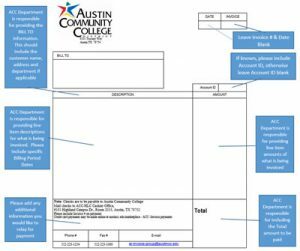 Once the invoice is received by ACC’s Accounts Receivable employees at group ar-invoice-group@austincc.edu, the Accounts Receivable employee will then verify a current agreement/contract has been approved by ACC’s Contracts Department. Once Accounts Receivable has determined a current contract is in place and the requested invoice is in compliance with the terms of the contract, the invoice will be entered into Colleague by an Accounts Receivable employee. Colleague will assign the invoice # and the Accounts Receivable employee will add the invoice # and the account ID to the invoice emailed by the department. At the time the invoice number is assigned by the Accounts Receivable employee, an entry is automatically posted in Colleague which will credit the GL # the department has specified in their email to code the invoice to. The Accounts Receivable employee will now email the invoice to the customer. The Department and the group ar-invoice-group@austincc.edu will be cc’d on the email to the customer thus letting the Department requesting the invoice know the invoice has been created and sent to the customer. Monthly, an aging report will be created by ACC’s Accounts Receivable and emailed to the departments which have invoices with outstanding balances. The department who requested the invoice will be responsible for contacting the customers with outstanding balances that have not been paid in accordance to the agreement on file with ACC’s contracts department.